This pack contains everything that you need to start getting the best out of your printer. Epson creates high quality products that help to make your life easier and provide you with professional standard results. 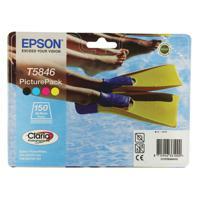 <br><br>This pack combines excellent Epson ink cartridges with glossy photo paper meaning that you have everything that you need to start printing photographs immediately. The ink and paper work together perfectly to ensure that ink does not run and that your photos are kept clear and sharp.